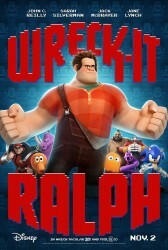 Plot Outline: Wreck-It Ralph longs to be as beloved as his game's perfect Good Guy, Fix-It Felix. Problem is, nobody loves a Bad Guy. But they do love heroes... so when a modern, first-person shooter game arrives featuring tough-as-nails Sergeant Calhoun, Ralph sees it as his ticket to heroism and happiness. He sneaks into the game with a simple plan -- win a medal -- but soon wrecks everything, and accidentally unleashes a deadly enemy that threatens every game in the arcade. Ralph's only hope? Vanellope von Schweetz, a young troublemaking "glitch" from a candy-coated cart racing game who might just be the one to teach Ralph what it means to be a Good Guy. But will he realize he is good enough to become a hero before it's "Game Over" for the entire arcade?